This week a White-beaked dolphin stranded in the Oostvoornsemeer, a lake south-west of Rotterdam here in the Netherlands. It is a very popular spot for diving schools, and it is where we finished our PADI Open Water Diver course this summer. Two bird-watchers spotted the dolphin and called the Eerste Hulp Bij Zeezoogdieren (EHBZ), or First Aid for Sea Mammals, who think the dolphin swam into the Rotterdam harbor last weekend during a storm. There are about 7,000 to 8,000 white-beaked dolphins swimming around in the North Sea. The dolphins are not very often seen around the Dutch coast, however on 22 April 2004 divers spotted a group of at least 10 white-beaked dolphins off the coast of Goeree. 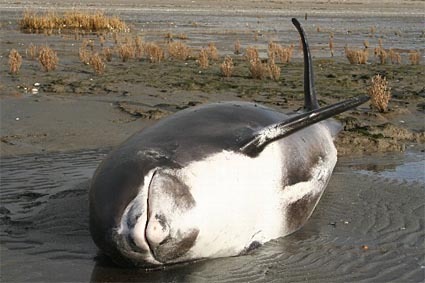 Unfortunately dolphin-strandings are more common; every year several of them strand on Dutch beaches. I was surprised to find out on my visit to the Natural History Museum in London last month that every year between 350 and 800 whales, dolphins and porpoises wash up on British shores! This is according to the National Whale Stranding Recording Scheme. Since the scheme started in 1913, more than 11,000 animals have been recorded. Museum scientists study the remains of the stranded cetaceans to learn more about their biology. This entry was posted on Thursday, December 22nd, 2005 at 8:12 pm CET and is filed under Leiden, Life in Holland, Nature, News	with tags . You can follow any responses to this entry through the RSS 2.0 feed. You can leave a response, or trackback from your own site.